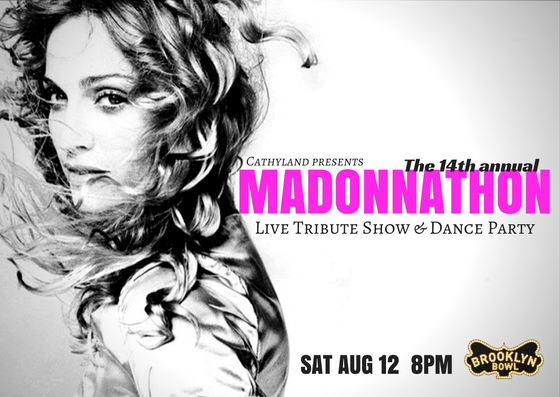 Hosted by Cathy Cervenka & friends!, DJ Chauncey D spinning Madonna hits, remixes and rare tracks! DANCE + SING, GET UP + DO YOUR THING! At Brooklyn Bowl for the 14th annual MADONNATHON! 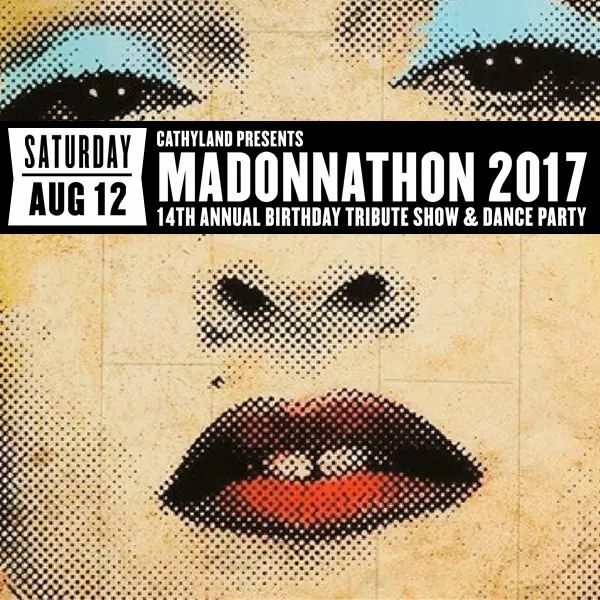 Bigger + better every year, MADONNATHON is the biggest Madonna birthday show/ dance party in the world – featuring LIVE performances by some of New York City’s most talented musicians/singers, collaborating to bring you the very best of Madonna’s huge repertoire! DJ Chauncey D (Madonna Worship) spins Madonna hits, remixes and rare tracks! This year’s all-star cast includes: Amber Martin, Brian Charles Rooney, Lane Moore, Shannon Conley, Anna Copa Cabanna, Queen V, Michael T, Sophia Ramos, Danielle Tyler, Leslie Goshko, Travis Moser, Cathy Cervenka, Chrissi Poland, Fou Fou Ha, Emily Greene Strigl, Mark Rinzel, Jenna O’Gara, Daryl Glenn, Kate Steinberg, Daniel DeJesus & more TBA! All Backed by the Material Band: Mark Christopher, Matt Lindsey, Alan Camlet, Mike Greco, Guy Finley, Jesse Kraków, Ki Ki Hawkins Jack Fuller, Tess & Claudia Chopek! Wear YOUR best Madonna look (killer matador cape, virgin bride, lucky star, peepshow dancer, geisha glam, cone bra & ponytail, urban cowgirl, Evita, material girl Marilyn, etc). Best-dressed Madonna fans will sing onstage w/the band + win prizes! Join us August 12th for a fun Saturday night all about her Madgesty!